I’m starting to really enjoy Alastair Reynolds’ books. 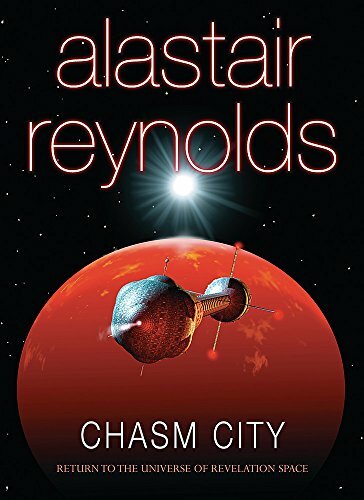 After a shaky start in Revelation Space (a novel that showed a lot of promise but which was riven with flaws), he’s hit his stride in Chasm City, which is not a prequel to the earlier book although it is set some decades earlier in the same Conjoiner/Demarchist universe. This time round, he’s not trying to cram a dozen wonders into a single novel, but just to tell a good story. And it is a good story. Tanner Mirabel has travelled across interstellar space from backward, war-torn Sky’s Edge to glorious, high-tech Yellowstone for one purpose: murderous vengeance. His prey, we learn, has made the same journey with the same motive. Neither find quite what they expect: while they were in transit, the Yellowstone system has been devastated by the Melding Plague, a disease that infects nanotechnology. Chasm City, once a dazzling metropolis, is now a nightmare of twisted buildings, lawlessness and decay, the stratifications of its architecture reflecting the new and terrible stratifications of its society. It is a place where power is the only law. The bulk of the novel tells of the playing out of the various hunts. In the interstices of this story, however, a second story is told in dreams induced by an “indoctrinal virus”. It tells of Sky Haussmann and the Flotilla that first carried humans from Sol to Sky’s Edge, and of the atrocity for which he was crucified, and of something more mysterious. There follows a long and complex series of intrigues and betrayals, punctuated by bursts of violence. Indeed, the twists and turns of the plot are so complex that I often found myself unable to remember who has betrayed whom and why. Scattered through all this, there are many clues that not all is as it seems. To say more would be to cut through the Gordian’s knot of identity and memory that lies at the story’s heart. Alas, at the climax Reynolds doesn’t quite manage to cleanly untangle this knot, and the jigsaw pieces of plot don’t fit as smoothly as they should. Nevertheless, it’s an intense and interesting novel, well told and full of invention. My hopes are high for Redemption Ark, which returns to the matter of the Inhibitors and the struggles of various human and transhuman factions. The Maus graphic novel series (part 1: my father bleeds history, part 2: and here my troubles begin) by art spiegelman. I know I have mroe to recommend but my brain is... stalling... need....sleeeeeep.